So there, all you who doubted the aerial capabilities of the porcine race … pigs really do fly! The pig’s body and feet are worked in rounds. 1. Ch 2, 4 sc in 2nd ch from hook. 2. 2 sc in each sc. 3. 1 sc in each sc. 4. 2 sc in each sc. 5. 2 sc in each sc. 6. *1 sc in next sc, 2 sc in next sc* around. 7-15. 1 sc in each sc around for 8 rows. 16. *1 sc in next 6 sc, 1 sc decrease in next sc* around. 19. *1 sc in next 2 sc, sc decrease in next sc* around. Do this until the hole is small, stuff piggy, continue decreasing until the hole is shut. Ch 5, sc in 2nd ch from hook, hdc in next ch, dc in each of next 2 chs. Finish off and sew to head. Ch 4. Turn and do 1 sc in each of next 3 ch sps. Ch 1, turn. 3 sc, ch 3. turn. 3 sc on chain, 3 hdc on the three sc. Ch1, turn. 3 sc, ch 4. Sl st in 2nd ch from hook, 3 sc in chain, 3 hdc. Ch1, turn. 4 sc, ch 5, sl st in 2nd ch from hook, 3 sc in ch, 3 hdc, ch 3 turn. *Work 4 dc decreases down the edge of wing opposite the feaher ends. Ch 3, turn, repeat from * once. Fasten off. Sew to body just behind ears. Ch 2, 4 sc in 2nd ch from hook, 1 sc in each sc around for two rows. Fasten off, stuff, sew to body. Pattern designed by: Shannon Murphree of the My Love as Deep blog, licensed under a Creative Commons Attribution-Noncommercial-Share Alike 2.5 License. Have looked at pictures of this pig for a month. Followed many links that did not get me to the pattern. Finally found a good link from commutercrochet from a few years back. on April 20, 2008, I did not see this on Ravelry or any of the free crochet pattern sites. A lot of people would want this pattern if they could find it out there for free. 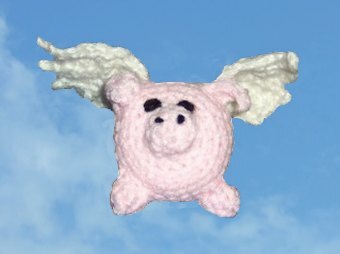 I’m glad that I was able to help on your determined quest to find the winged pig crochet pattern. I thought the pattern was available on Ravelry, but perhaps not. I hope your winged pig proves to be the guardian angel of pigs for you. Thanks for taking the time to let me know your story!